The Composite Centre of the University of Sheffield Advanced Manufacturing Research Centre (AMRC) with Boeing has won £360,000 in funding to investigate the way composite material is developed for use in automotive components. The centre has formed part of a UK-wide research consortium tasked with developing innovative new manufacturing technologies and processes for composite material in the automotive sector. Based on the Advanced Manufacturing Park (AMP) in Rotherham, the AMRC has a £4.5m state-of-the-art centre supporting the development of advanced composite materials inside the Factory of the Future. The centre works with complex hybrid components and systems, which require manufacturing expertise in both composite and metallic structures. With funding from Innovate UK, the UK's innovation agency, the consortium will focus on a project to create strong lightweight vehicle and powertrain structures to help vehicles deliver lower emissions. It is made up of seven other companies and research organisations such as Jaguar Land Rover, SGL Carbon Fibres Ltd, the University of Nottingham and Nifco UK Ltd.
Composite assemblies used in automotive manufacturing, such as side impact beams in door panels or roof panelling are created using separate carbon fibre reinforced plastic (CRFP) structural composite components. These structures are secured by fixtures that are then "over moulded" together using more composite material, this not only makes the final parts more aesthetically pleasing, but can also incorporate additional functional features and details to any completed structure. The CRFP comes as "preformed blanks" of material which are then cured to the desired shape; it is the development and production of these preformed blanks that the AMRC Composite Centre will be investigating, using state-of-the-art technologies to create a more cost effective process for manufacturing automotive composite components. Hannah Tew, partnership lead at the AMRC Composite Centre, said: "Our role within the research project is to look at how the preformed blanks can be made cheaper, faster and stronger, using less material to produce lightweight composite automotive assemblies. The centre will investigate the use of creating the CRFP material using 3D weaving of commingled fibres and co-weaving of carbon and thermoplastic fibres, instead of the traditional 2D weaving. Dr Hassan El-Dessouky, composites technical lead, at the AMRC Composite Centre, said: "The 3D weaving will provide different material properties for the preformed blanks than traditional 2D technology, improving performance and making it cheaper and quicker to produce. It is hoped we prove that less material will be needed making 3D woven CRFP more cost-effective." 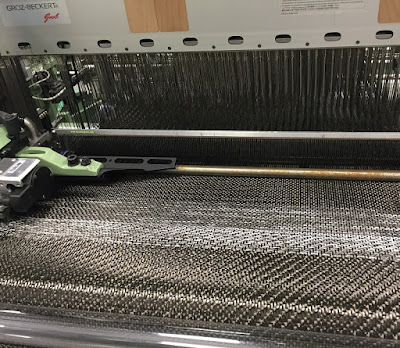 Research will also be carried out to see if the way the CRFP fibres are orientated during weaving affects the production and quality of the composite material, allowing the team to improve component geometry and "lightweight" the composite material more than standard composites. The AMRC is also set to receive sign off today for £10m via the Sheffield City Region to fund the development of Phase 1 of its Lightweighting Centre, a project aimed at supporting the manufacturing and research of lightweighting structures and materials. Phase 1 involves the development of a 8,300 sq ft facility on the Sheffield Business Park to house a 300 tonne hydraulic press and associated equipment and experimental capital equipment required to deliver research programmes for three OEM investments. The scheme is the focus for a number of inward investment propositions. SCRIF funding is sought as part of an overall £25m capital investment project for phase 1.